Advanced energy storage promises to play a key role in the modernization of our nation’s electricity grid. Future grid development will likely require energy storage that not only enables the integration of increasing amounts of renewables, but also improves the grid’s operating capabilities, enhances reliability, allows deferral of infrastructure investments and provides backup power during emergencies. Expanding the benefits of energy storage for the grid will require developing technologies that can be easily sited and can match the power and energy scale of the electrical grid while also minimizing cost. Electrochemical energy storage (e.g. batteries) provides significant opportunities to address these needs. However, wide acceptance of such energy storage solutions for grid services requires technical improvements to deliver greater reliability, cost-effectiveness, and duration of discharge at the required power levels. For grid-scale storage, volume and mass of the storage system is not a primary constraint. As a result flow batteries, which store chemical energy in external tanks, can be used to deliver larger amounts of stored energy at a lower cost per kilowatt hour (kWh). While commercially available flow battery systems have historically been costly, the relaxed volume constraints make it possible to consider chemical components that previously would not have been thought viable. Without the volume constraint, the battery chemicals can be optimized for performance, to drive down the cost of materials and also to reduce the toxicity of the battery components, which otherwise increase manufacturing and operational costs. The Harvard team is addressing the challenges of grid storage by designing a flow battery based on inexpensive organic molecules in aqueous (water-based) electrolyte. The team has focused on non-toxic quinone molecules, which can be found in plants such as rhubarb, as an electroactive chemical that can reversibly store energy in a water-based solution at room temperature. The group employed theoretical and organic synthetic methods to evaluate hundreds of thousands of possible quinone-based chemicals that might offer the necessary electrochemical potential, solubility in water, and thermodynamic stability. The first demonstration of these systems, 2,7-anthraquinone disulfonic acid coupled to a bromine solution, has a reduction-oxidation window of 0.8 V. Details of this early, proof of concept battery were published in 2014 (see publications below). Since these experiments were completed, the group has moved to make their system cheaper and less toxic, and to increase the voltage to 1.2 V. To date, the team has analyzed over one million quinone-based molecules using computer simulation, with thousands of them determined to be promising for storage. Of these, a dozen were selected for synthesis and testing, based upon their expected synthetic feasibility, electrochemical redox potential, aqueous solubility, and chemical stability during operation. The team has developed a prototype cell design using safer alkaline liquids, no precious metals, and other battery components made of plastic or inexpensive metals with coatings proven to protect against corrosion. The team is advancing this innovative storage concept with goals of improving performance, including power density, cycle life and round trip efficiency. Their goal is to have a pilot-scale system ready for external testing by the end of the performance period. Sustainable Innovations, Harvard’s commercialization partner, is developing a 3 kW system incorporating Harvard’s chemistry for demonstration by the end of the performance period. Sustainable Innovations is currently raising funding to complete commercialization of a low-cost electrochemical platform that will support the launch of a series of products that meet critical market needs. If Harvard’s innovative storage concept proves commercially competitive, this technology can be inserted into a low-cost platform to yield a range of quinone based battery systems, with toxicity, cost and performance features that suit a variety of applications ranging from uninterruptable power supplies through micro-grid backup, to full grid support. Technoeconomic analysis and customer interest will determine the top candidates resulting from this project. The relatively non-toxic chemicals used in the battery design are widely used in the textile dye industry. Because these materials are already in commercial production, it is likely that scale-up for the organic battery will be rapid and cost effective. The use of redox-active organics in flow batteries has the potential to significantly drop the cost and toxicity of large scale grid storage batteries. This specific concept of using water-soluble quinones is unprecedented for flow batteries, and now provides a proof of concept for low-cost, more environmentally benign alternatives to the accepted chemistries of the past. With continuing development, and scale-up to manufacturing in large quantities, redox-active organic battery technology has the potential for a highly competitive evolution of costs. B. Huskinson, M.P. Marshak, C. Suh, S. Er, M.R. Gerhardt, C.J. Galvin, X. Chen, A. Aspuru-Guzik, R.G. Gordon and M.J. Aziz, “A metal-free organic-inorganic aqueous flow battery”, Nature 505, 195 (2014). Kaixiang Lin, Qing Chen, Michael R. Gerhardt, Liuchuan Tong, Sang Bok Kim, Louise Eisenach, Alvaro W. Valle, David Hardee, Roy G. Gordon, Michael J. Aziz, and Michael P. Marshak, Alkaline Quinone Flow Battery, Science 349, 1529 (2015). Qing Chen, Louise Eisenach, and Michael J. Aziz, Cycling analysis of a quinone-bromide redox flow battery, Journal of The Electrochemical Society 163:1, A5057-A5063 (2016). Suleyman Er, Changwon Suh, Michael Marshak, Alan Aspuru-Guzik, “Computational design of molecules for an all-quinone redox flow battery”, Chemical Sciences, 6, 2015, 885-893. Qing Chen, Michael R. Gerhardt, Lauren Hartle and Michael J. Aziz, “A Quinone-Bromide Flow Battery with 1 W/cm2 Power Density”, Journal of the Electrochemical Society, Vol 163: 1, 2016, A5010-A5013. 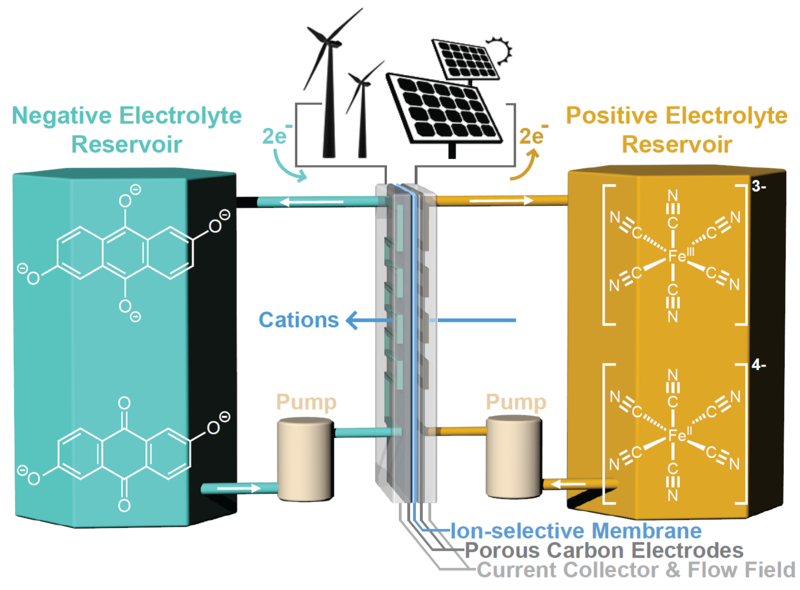 Brian Huskinson, Michael P. Marshak, Michael R. Gerhardt, Michael J. Aziz “Cycling of a Quinone-Bromide Flow Battery for Large Scale Electrochemical Energy Storage”, ECS Transactions, 61, 2014.